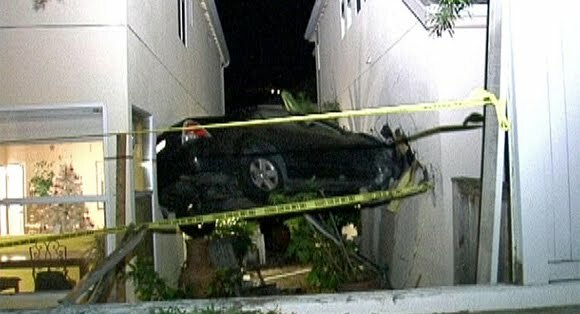 SAN PEDRO -- Police are investigating a crash in San Pedro that left a car wedged between two houses several feet in the air. The accident happened around 1:15 a.m. Sunday in the 1400 block of West 17th Street. The 18-year-old driver of a Ford Fusion apparently ran a stop sign at 17th Street and Weymouth Avenue and then hit a curb. The car crashed through a fence and ended up stuck in between two homes, about five feet off the ground. Police say it doesn't appear the driver ever applied the brakes. "I thought it was an earthquake. I didn't think it could be anything else until I walked down and there's a car sticking in there," said resident Carter Miller, who was settling into bed when the car crashed into his home. The driver was arrested on suspicion of driving under the influence of alcohol. Neither he nor his 18-year-old passenger were seriously hurt. The homes sustained significant damage, but no one inside was hurt. The house that suffered the most damage was recently purchased, and the owners were planning to move in next week.